1. Arrive at campsite and park under shady tree. 3. Open bottle of wine. 4. Decide on red or green Pringles. Mmmm. 5. Sit back and watch the proper campers next door wrestle with tangled ropes and inadequate foot pumps in the midday sun. If you’ve got any left, maybe offer them a Pringle. 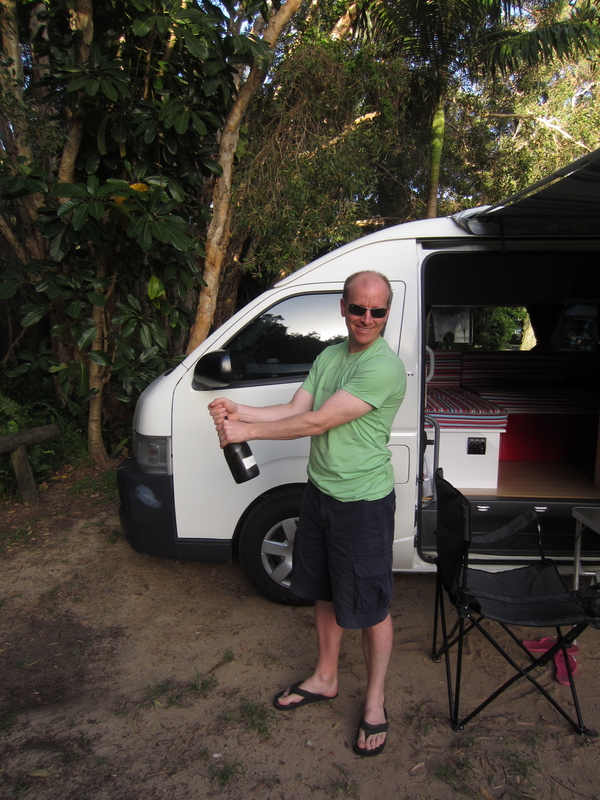 And so began our first trip in the campervan. 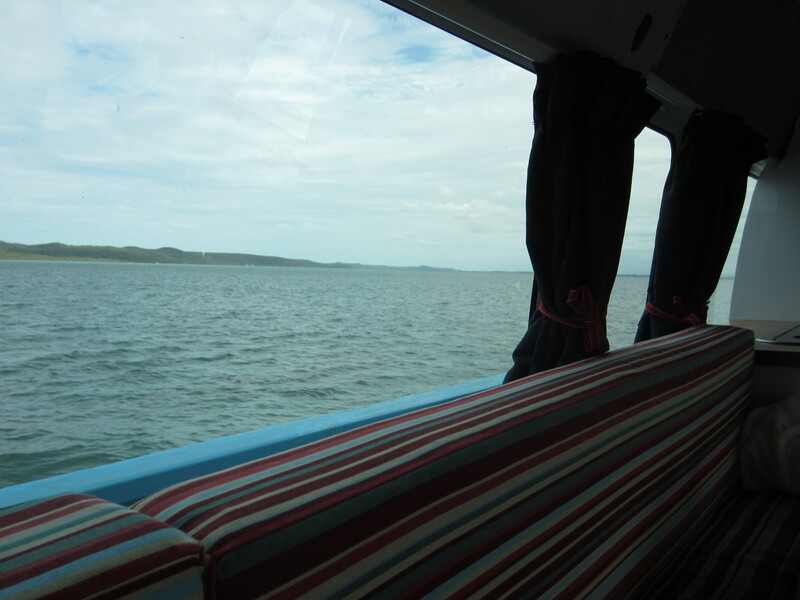 It’s probably not a purist’s view of a camping weekend but (in our limited experience) a brilliant alternative. 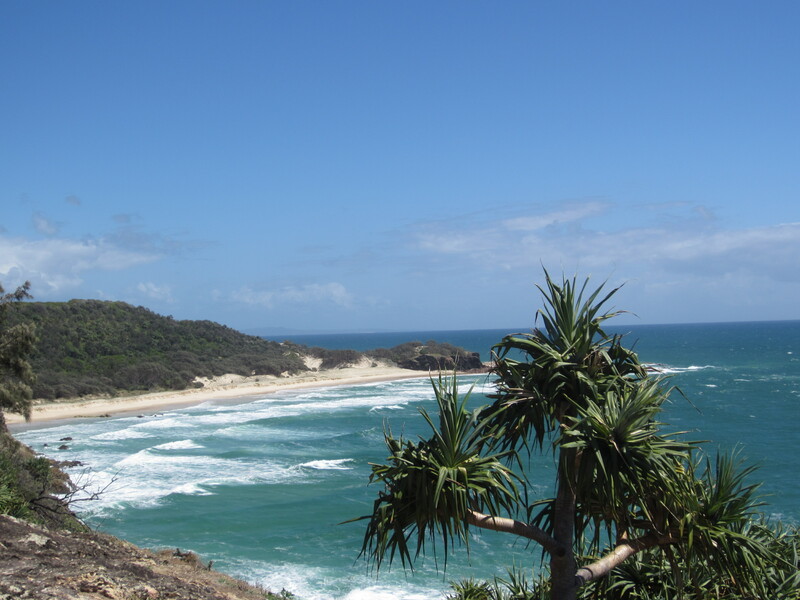 We took the ferry to North Stradbroke Island – the second largest sand island in the world and a beautiful spot. It’s very accessible from Cleveland so we’ve been lots of times, but this was the first time we didn’t have to rush for the last ferry home. 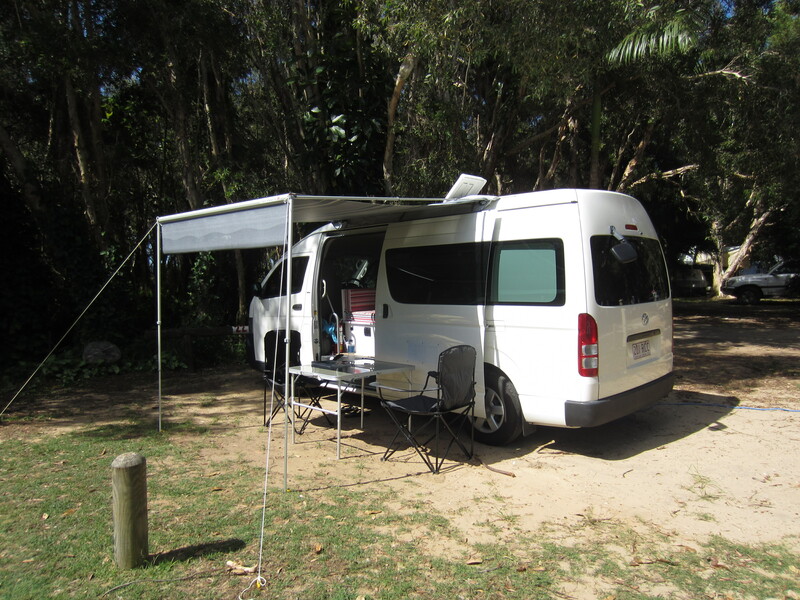 We stayed at the Adder Rock campsite, right next to the beach near Point Lookout. 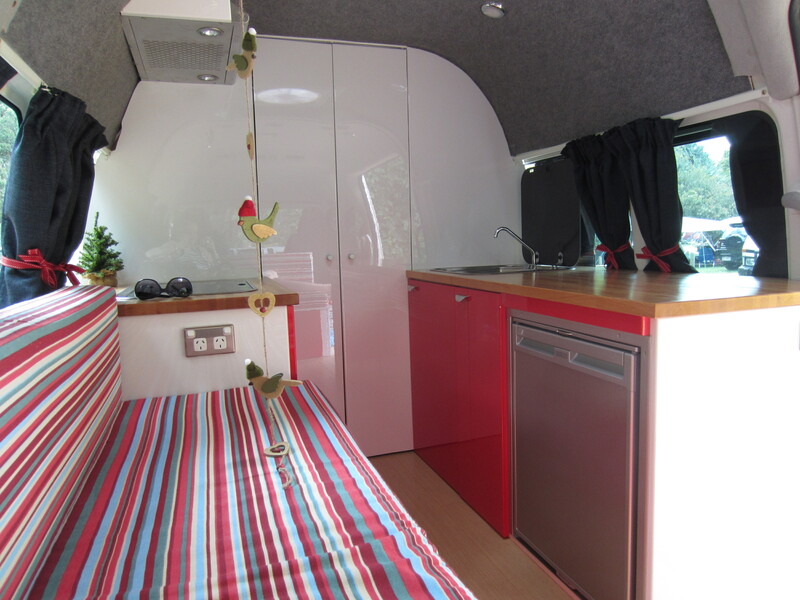 Surprisingly, ours was one of the only campervans amidst an entire village of tents – and these were not your average two-manners, but mini canvas empires with dining rooms and adjoining corridors – all very swish. 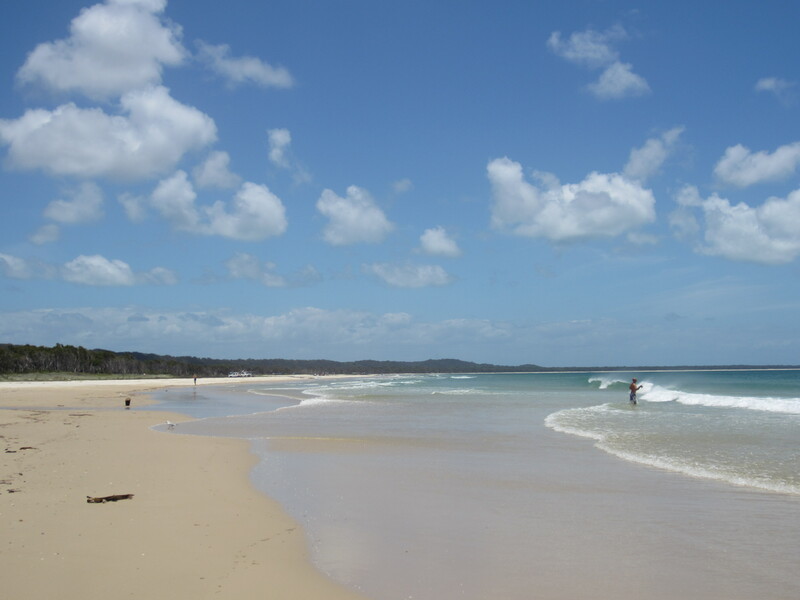 And a few metres from our pitch was Home Beach which is just lovely: a small bay which is perfect for swimming and then a sweeping stretch of white sand. Once we’d sussed out our surroundings and entertained ourselves with our new toys (an ergonomic broom for the wooden floor being the highlight) we were quite content to just kick back and enjoy the afternoon sunshine. Yes our awning would have been very effective.. if we’d parked the other way round. Tsk – amateurs. Our very subtle Christmas decorations (particularly subtle when compared with our neighbours’ fairy light extravaganza and lifesize inflatable reindeer). We were very taken with our little van. It turned out we had heaps of storage, and lots of nooks and crannies so that everything had its place. The seats were comfortable (hurrah!) and the bathroom was fabulous. 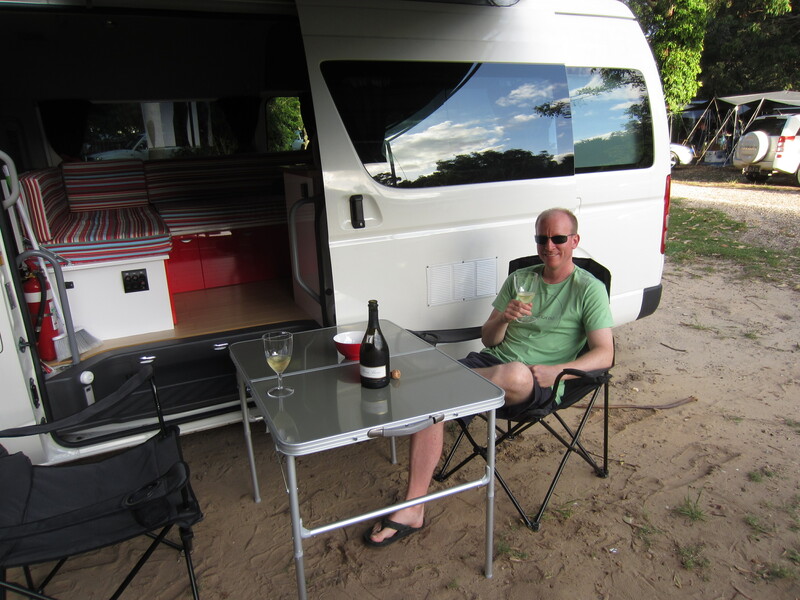 Unfortunately the gas wasn’t connected due to our plumber going awol the day before, so there were no cups of tea this trip – a bottle of bubbles stepped in at the last moment to toast our maiden voyage. And it was so hot I don’t think anybody (i.e. Paul) even noticed I served the same trio of salads for each meal. As soon as the stove’s working though I’ll have to consult my campervan cookbook and try to conjure up some cuisine worthy of competing with the other delicious aromas drifting around the site at 6pm. We’d planned the weekend as a kind of test run to see how everything worked and whether another trip to Bunnings was required (it usually is) … but all I wrote down was ‘more bin-bags’ so it turns out we were quite organised. View from the car ferry on the way home. We were only away one night but it felt like a proper break – apparently that’s the start of the camping bug. Since we returned we’ve surrounded ourselves with maps and brochures to decide on the next destination. All recommendations welcome! 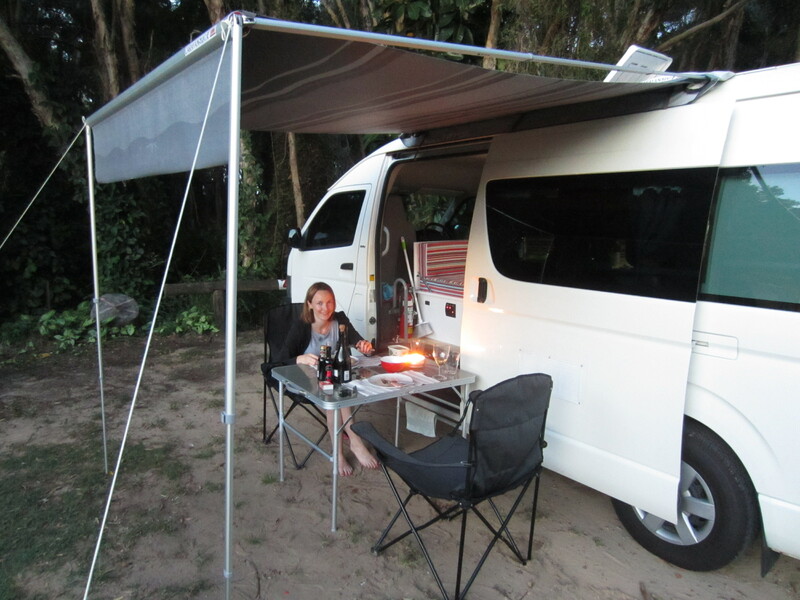 This entry was posted in Campervan life, Campervan trips and tagged Adder Rock campsite, Bunnings, campervan conversion, Campervan Cookbook, Campervan photos, camping cuisine, camping holidays, camping reviews, North Stradbroke Island, stress-free camping by Rach. Bookmark the permalink. I will give Paul lots of camping places to go! Its nearly been 3 weeks since your last trip!!! I know – can you have a word please Neil?